Home Boxing Milan Melindo vs Hekkie Budler Sinong Liyamado? Milan Melindo vs Hekkie Budler Sinong Liyamado? 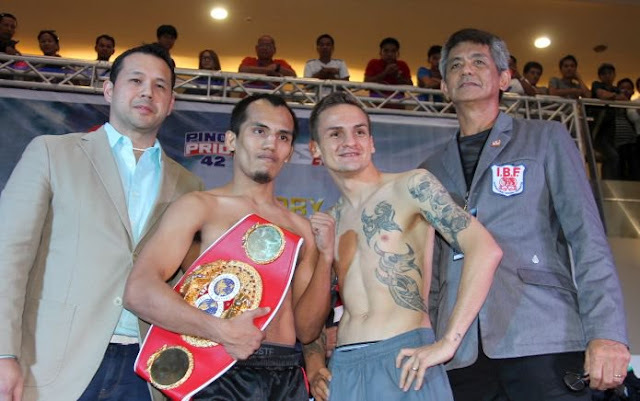 Tonight, Two best light flyweight Milan Melindo and Hekkie Budler ay maghaharap para sa isang titulo. Milan will defend his IBF light flyweight title vs the South African's Budler. Although both are good and in good condition, but who can possibly win this fight? Kung titingnan natin ang kanilang record Melindo 36W(13KO)-2L, Budler 31W(10KO)-2L. Lamang ng onti si Melindo, pero sa mga kalibre ng mga na kalaban nila di natin maitatago na si Budler ang mas nakakaangat. Additionally, Budler is an experieced boxer and became a world champion since 2009. He is also a two-division world champion winning IBO World Light Flyweight title in 2010 and winning IBO World Minimumweight title in 2011. He also won WBA World Minimumweight Title in 2014. Habang si Melindo naman ay baguhang champion at siguradong ma presure sa kanyang unang depensa ng titulo. Kung pagbabasihan natin sa lahat ng aspeto, si Budler ay ang mas llamado sa laban na ito. Ibibigay natin ang 60% chance to win for Budler dahil isa siyang tunay at subok na kampeon mula pa noon. 40% para kay Milan Melindo but it doesn't mean that he hasn't have a chance. Remember, Melido is getting better and better every fight, that last fight against Akira Yaegashi proved that he is one of the best fighter in the light flyweight division so anything can happen and also Melindo has the hometown advantage.